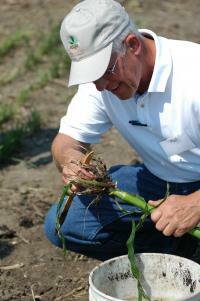 An online review course is being offered through Iowa State University Extension and Outreach to help individuals prepare for the next Certified Crop Adviser (CCA) examination on Aug. 4, 2017. The review course is offered exclusively online and includes presentations on crop management, pest management, nutrient management and soil and water management. The enrollment period for the Aug 4, 2017 exam runs May 1 through June 23, 2017. Exam registration is through the national Certified Crop Adviser organization. Each presentation includes a practice quiz to help test knowledge and comprehension. The review course includes supplemental materials and an overall practice exam, which may be attempted three times. Technology requirements include a valid email address, a web browser and connection to the internet, connected speakers, a printer if you wish to print out PDF versions of the presentations, and the Flash Player browser plug-in to view the presentations. If you don’t have a Flash Player, you may download it for free. Adobe Reader is needed to open PDF documents, however, if you don’t have Adobe Reader, you may download a free copy. All review course materials such as quizzes, PDF files and supplemental materials are available on iOS devices, such as iPads, with the exception of the flash-based presentations. For more course details and to register, visit www.aep.iastate.edu/cca. For assistance with registration, contact ANR Program Services at 515-294-6429 or anr@iastate.edu. For questions regarding the CCA program and course content please contact Bob Hartzler at 515-294-1164 or hartzler@iastate.edu or Kristine Schaefer at 515-294-4286 or schaefer@iastate.edu. Kristine is the program manager for the Pesticide Safety Education Program (PSEP) at Iowa State University Extension and Outreach.